Xiris Automation Inc. designs inspection systems, or “machines that can see”. Our products are used for process and quality control and provide some of the world’s most dynamic manufacturers with the ability to detect, recognize, and interpret quality issues in their manufactured goods. These technologies are applied across many different industries to improve safety, efficiency and productivity. We have developed camera technology to help monitor both Open Arc welding and Sub Arc Welding processes which has significantly enhanced the welding industry. 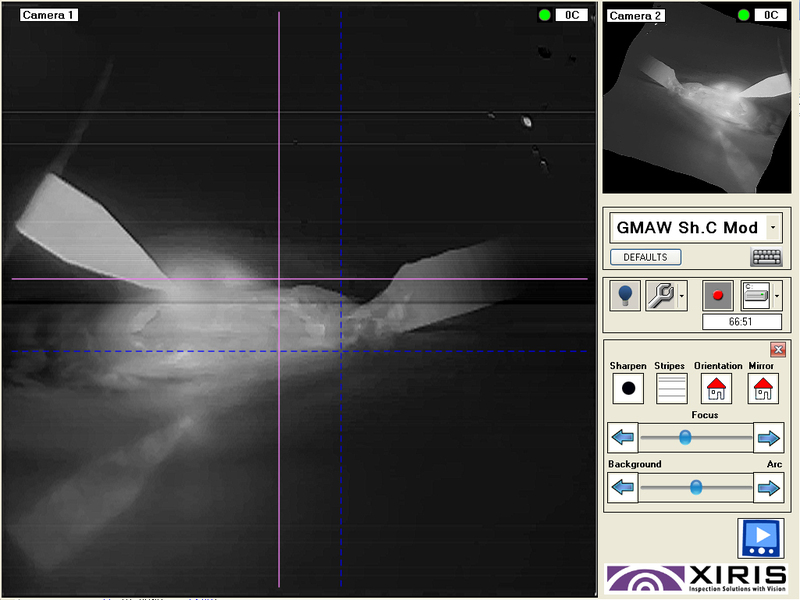 Welding cameras can make a drastic difference in manufacturing and quality control for Open Arc welding processes such as GMAW (MIG/MAG), GTAW (TIG), Plasma or Laser welding. By integrating a camera at the weld head, fabricators can improve the human interpretation of the weld quality by providing a better image than otherwise possible and therefore decrease the chances of human error. The Xiris View Camera for Open Arc welding (XVC-O) is a complete system that comes with monitor, software, and camera, and can be easily integrated to any automated welding process. Beyond the production line, the system can also be used as a training tool, inside and outside of the classroom. With video recording capabilities, the XVC-O allows instructors to record welds and defects for offline review, analysis and instruction. The result is a better tool to teach welding to more students, as well as a way to introduce a more consistent assessment and review process. Monitoring Submerged Arc welding is less difficult than Open Arc welding processes because of the blanket of flux that covers the welding process. The blanket of flux used in Sub Arc Welding prevents spatter and sparks but ensuring the alignment and angle of the weld tip is still essential to ensure the quality of the resulting weld. In addition, monitoring the continuously fed wire is another feature that needs monitoring in order to ensure the consistency of pressure of the arc. The Xiris View Camera for Submerged Arc Welding (XVC-S) provides clear images of the weld environment, weld tip and feeder wire to the operator in order to more accurately control the parameters that make a good weld. It also removes operators from potentially hazardous work environments without sacrificing their ability to monitor the weld process. Welding injuries are far too common in today’s work environment and any steps that can be taken to improve workplace safety as well as productivity should be taken. Just last year, a Texas-based company says an explosion on a Mexican oil platform off the Louisiana coast was caused by unsafe welding practices. This report followed not one, but four lawsuits against the company asking for $20 million each in actual damages, plus a total of $100 million in punitive damages*. Safety concerns such as these could be reduced with the introduction of a Xiris Weld Camera. Let us help you prioritize safety and efficiency. The XVC-O comes in both a standard and advanced system, and can be easily integrated into a manufacturing line, or the classroom. To learn more about our products and services please visit our website www.xiris.com or contact our sales team directly at sales@xiris.com. Recent advancements in machine vision technology have made a new type of inspection capable of recognizing defects related to the forming and welding area of a tube or pipe. The result is improved quality assurance and process control on the production line. The new type of inspection device is a laser-based triangulation system that measures the outside contour of a tube or pipe in the vicinity of its weld. Typically NDT (non-destructive testing) systems are placed at the end of a production as a final check. However, the laser inspection system can be placed directly after the weld box. This system can let operators know what is changing in the welding process, allowing them to perform corrective action before significant scrap occurs. This capability is especially helpful for one of the most common defects found across all types of tube manufacturing: insufficient or excess squeeze pressure. This pressure is used to form the tube during welding and can be monitored by measuring the bead ratio of the tube. The bead ratio is an important measurement for ERW/HF processes to monitor. It is calculated by measuring the maximum bead height above the parent material, divided by the thickness of the parent material wall thickness. The bead ratio is an excellent indication of the amount of squeeze pressure used on an ERW/HF mill during welding. When the squeeze pressure is too high, molten material will spill out of the seam, causing a higher bead to form and increasing the bead ratio. Likewise, when the squeeze pressure is too small, the parent material will not be pushed together enough and a sunken weld will result, causing the bead ratio to fall. By taking into account the wall thickness, the bead ratio can determine the severity of a sunken or raised weld for a particular weld thickness, making it more of a measurement relevant across all tube thicknesses. The Bead Ratio (h/e), where “h” = the height of the bead and “e” = the tube wall thickness. 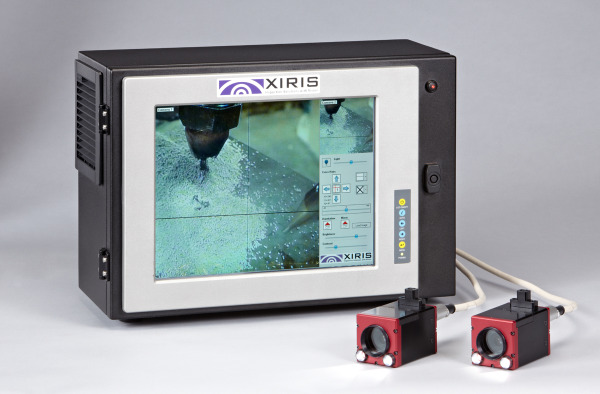 Xiris Automation Inc. has developed a non-destructive inspection system called the WI2000p Weld Inspection System. The WI2000p includes a laser line and a camera whose optical axis is offset to the axis of the laser line by an “offset angle”. The WI2000p creates a visible cross-section of the tube by projecting the laser line on to the tube and capturing an image of the line using the camera. The resulting image shows a profile of the tube surface as if it were cut in cross section. If a tube is ideally round, the laser image will represent a section of an ellipse and any anomaly such the bead height can be mathematically detected. The WI2000p bases all of its measurements on the differences between the actual laser profile line seen by the camera, and the ideal mathematical profile based on the tube parameters. By knowing the position of the actual laser profile, the ideal profile, and the size of the pixels in the image, the WI2000p can detect weld bead profile defects that often escape detection by other quality tools such as Eddy Current testing, or Ultrasonic Testing techniques. Xiris recently received a call from a prospective client asking about our XVC-S Submerged Arc View camera and how it worked. They had two main questions: Can two cameras be monitored simultaneously? And can their images be recorded? After a short conversation with the customer, the reason for the request became clear. The customer was welding tanks with the Submerged Arc welding process, and they had a problem. They operate two sub arc welding heads, approximately 13’ apart, both of which need to be monitored for weld process quality. Their present monitoring solution used an operator sitting in a chair mounted to a ladder. The operator would move from one head to the other during the welding process in order to be able to see what was going on with both heads. During one of these shifts, an operator fell, and was injured. The customer’s initial solution was to replace the chair and ladder with a man lift to allow the operator to move between the weld heads, and welding controls when adjustments were required. But it still was not an ideal situation. Instead, the customer wanted the operator to remain on the floor with the welding controls, monitor both welding heads, and perform the adjustments from there. The standard XVC-S View Camera system was designed for one primary camera, but has recently been updated. The updated XVC-S+ system with multiple camera heads. The XVC-S+ system, which comes complete with computer and HMI console allows for two cameras to connect to the console, and be displayed on a single screen in a split screen view. With this system, the operator is able to monitor both welding head images side by side on a single screen. With features such as adjustable crosshairs and targets on the screen, the operator is able to make continuous adjustments to the weld heads from a safe, remote operating location. The images can be saved to the hard drive on the computer for off line viewing, review and analysis, allowing the customer to use the video segments for training, off line quality audits, and process troubleshooting. In conclusion, a previously unsafe and inefficient welding environment resulted in injury and poor productivity. These problems were resolved with the addition of on system, the XVC-S+ Sub Arc View camera system including two cameras and split screen display capability. When instructing such a unique trade, it is important that students not only understand what is being taught, but can see the demonstration. Being able to see and understand what is occurring with a weld tip and arc, as well as the environment around it (weld seam, weld pool, shielding gas, and wire feed) are all essential elements to understanding the welding process. Without a grasp on these elements and factors, there is little that can be retained by the student. This is all based on a visual demonstration that can be hard to provide in many welding institution settings. As technology and equipment advance, the ability to record lessons and welds adds an immense benefit to both students and instructors. Students can learn more outside of the classroom, as well as retain and digest all of the important elements of the lesson using video playback. This can be provided through the addition of weld cameras. Not any camera can be placed in such a hostile environment, and expected to function normally. Therefore, more research and development has been contributed to constructing a small, clear, and functional camera that can withstand this environment, and provide the best image quality. Xiris Automation Inc. has created such a camera, called the XVC-O (Xiris View Camera for Open Arc Welding). This allows video recording, clear images, storing/saving capabilities, as well as better classroom visuals for welding programs. This live weld feed can be attached to a simple monitor (as demonstrated above), or even a full size projector, and still provide a clear, comprehensive view of all elements. Xiris has also developed a version for submerged arc welding. Local colleges, such as Conestoga College, have added this kind of technology to their budding trades programs. As the Government of Canada announced this May, they are investing $2.3 million over the next five years towards Conestoga College’s new Centre for Smart Manufacturing establishment. Already using the XVC-O, these improvements have allowed Conestoga to become an extremely competitive College in the area, and one of the most competitive for the welding trade school industry. Other institutions, such as NAIT (Northern Alberta Institute of Technology) have also added systems to their curriculum and have noticed great improvements. NAIT’s Chair of Welding Programs, Chris Manning says “by displaying the captured welding video on a remote screen, the instructors can vastly improve the learning experience of their students, with improved learning success, which is always the instructor’s goal”. 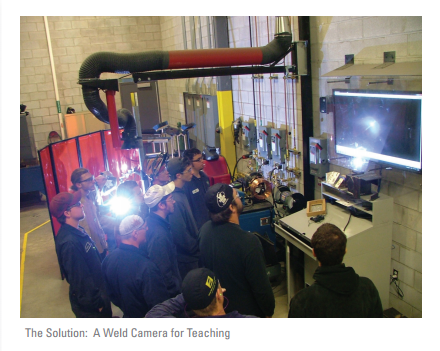 For more information about how welding cameras can assist welding education please visit www.xiris.com. 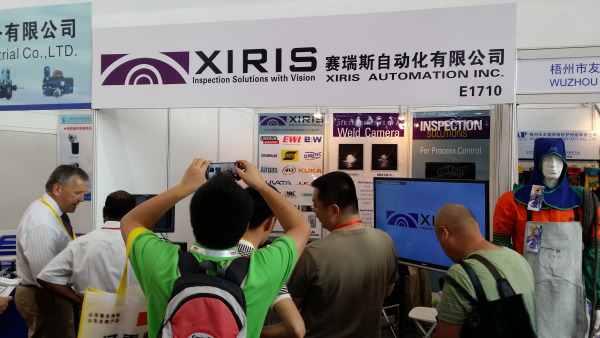 This year's show was a very unique opportunity for Xiris, as the use of weld cameras is new to China. This allowed us an advantage within the fast paced Chinese market to establish many new relationships with both machine builders and end users alike. The show was a late addition to Xiris' busy tradeshow schedule this 2014 season. Therefore our booth was not in our preferred location, but to our immense pleasure, this did not deter any interest in the Xiris XVC-O camera. There was an enormous turn-out and many discussions with potential customers. 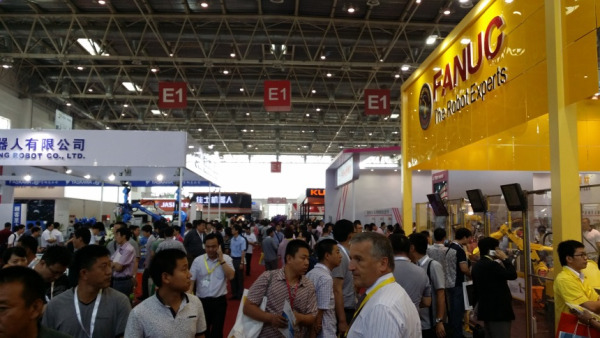 With both new and repeat customers in attendance, the booth was constantly crowded with interested prospective clients. This demand and fascination with our product was due to the unique qualities of the XVC-O in the industry. It is a perfect solution for monitoring many different welding processes, and perfect for welding professionals. In China, as elsewhere, System integrators and general fabricators are constantly fighting to differentiate themselves from the intense competition in the industry. The Xiris XVC-O could be the key. Our camera can provide enough image clarity to monitor the entire welding process including both the brightness of the welding arc and its darker background. Be sure to check out our website for full event details, and stay tuned for more updates on new products, sources, and pictures on all of our social media. We are now on Google+, as well as LinedIn and Twitter.